Somali banking company al-Barakat says all its international representatives have been taken off a US terror list. 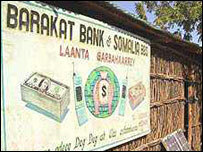 Al-Barakat, known for cheap overseas money transfers, was a mainstay of the Somali economy until a 2001 clampdown. But al-Barakat will still not be able to operate, as about $9m of funds are still being blocked by the US. The owner of al-Barakat, Ahmed Nur Ali Jimaale, told the BBC that his representative in Sweden had been the last to be taken off the list. This has been confirmed by the Swedish foreign ministry, which said it made representations to Washington. Mr Ahmed Nur appealed to the US to release the blocked funds, saying the action was hurting some of Somalia's poorest people, and had cost the company about $30m. When it was operational, al-Barakat operated in 40 countries and transferred up to $140m a year. Al-Barakat was listed in 2001. Later that year, the US blacklisted the firm's representatives, suspecting that the company had been involved in the transfer of funds used in the 11 September attacks - a suspicion that was later refuted by the report on the official inquiry into the attacks. The company operated on an ancient system known as hawala, which uses using food, fuel, electronics or gold as a way of balancing the books between operators - hawaladas - in different countries. Migrant workers can send money home to relatives by depositing money with a local hawalada, who then instructs an agent to disburse the money in the recipient's country.